WASHINGTON (AFP) - The United States Federal Reserve raised the benchmark interest rate on Wednesday (Dec 19), a move sure to anger President Donald Trump, but which also sent a clear signal that it expects to slow its rate increases next year. The Fed's fourth rate increase of the year, which sent Wall Street tumbling in mid-afternoon, moved the central bank squarely into the crosshairs of the President, who said a rate hike would be "foolish". Asked about the dangers of Mr Trump's Twitter rants, Federal Reserve chairman Jerome Powell told reporters political considerations played "no role whatsoever" in the central bank's decisions. In a unanimous decision, the Fed delivered on what some economists called a "dovish hike", raising the target range by 0.25 point, with 2.5 per cent at the high end, while signalling caution moving forward, especially as it keeps an eye on international developments. And according to their revised forecasts, central bankers now expect just two increases next year in the short-term lending rate used to set the cost of borrowing for everything from cars to homes. Despite healthy growth, Mr Powell acknowledged the increased sense of caution. He told reporters: "We have seen developments that may signal some softening, relative to what we were expecting a few months ago. Growth in other economies around the world has moderated somewhat over the course of 2018, albeit still solid levels." But since inflation has remained moderate, that allows the Fed "to be patient" in raising rates moving forward. Following volatile trade, Wall Street closed down sharply after the decision was announced, while the dollar advanced against the euro. Mr Powell said the Fed did watch markets but this was just one of many factors that went into policymaking. Although the Fed continues to view risks to the economy as "roughly balanced", the statement after the two-day policy meeting said the central bank "will continue to monitor global economic and financial developments and assess their implications for the economic outlook". The US is facing potential challenges from Mr Trump's trade war, a slowing Chinese economy and the potential economic and financial turmoil that could come in the wake of Britain's exit from the European Union. Increasing signs that the US economy may have peaked have caused stock markets to crumble in recent weeks, with Wall Street wiping out all of its 2018 gains. The policy-setting Federal Open Market Committee also released its quarterly forecasts showing that officials see economic growth moderating so that they now expect to increase the benchmark interest rate only twice next year rather than three times, as forecast in September. 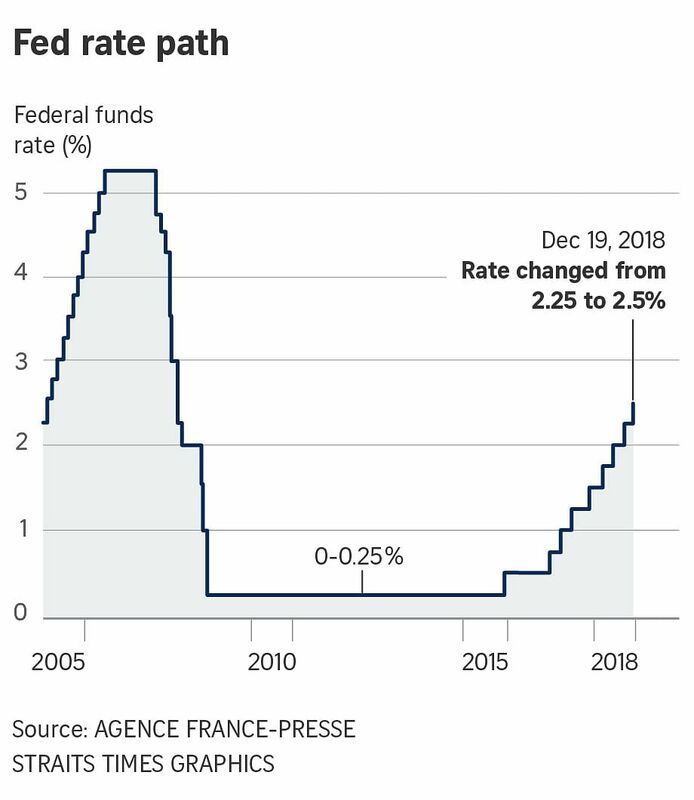 Five Fed officials slashed their forecasts, and now expect two or fewer hikes rather than four or more in the coming year. The Fed's median forecast for gross domestic product growth was cut to 2.3 per cent for 2019 from 2.5 per cent, which in turn brought the inflation outlook once again below the Fed's 2 per cent target, even with unemployment remaining at a 50-year low of 3.5 per cent next year. The projections are seen slowing further to 2 per cent in 2020 and 1.8 per cent in 2021. Mr Powell cautioned that the forecasts are individual views, not a plan for the Fed, and officials will revise their assessments as new data comes in. However, economists and analysts view them as a clear signpost for Fed action.